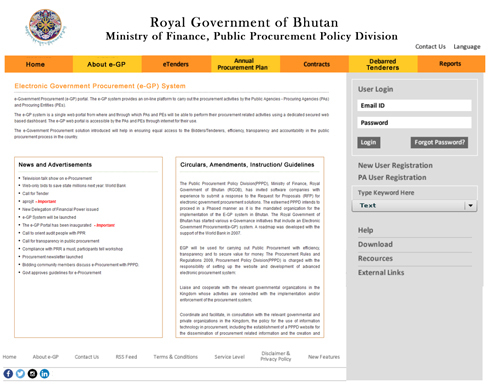 Electronic Government Procurement (e-GP) System for Royal Government of Bhutan, is a web based system which encompasses the total procurement lifecycle and record the all procurement activities. The purpose of this system is to maintain complete and up‑to‑date Public Procurement System activities of all public agencies as well as provide tender opportunities to all potential Bidders from Bhutan and abroad. The Contract was signed on 26 January 2016 in Thimphu, Bhutan between Government Procurement and Property Management Division (GPPMD), Department of Policy Division (DNP), Ministry of Finance, Royal Government of Bhutan and Dohatec New Media, which also developed the same system for the Bangladeshi government, will be working with local company, New Edge Technologies. This e-GP project is being led by Government Procurement and Property Management Division (GPPMD), Department of Policy Division (DNP), Ministry of Finance, Royal Government of Bhutan. It is expected that Bidders will be benefitted through easy and equitable access to information and procurement opportunities. The engagement with the private sector will increase. There will be marked reduction in fraud and corruption and bring about higher transparency. URL for this e-GP System is: http://pppd.dohatec.com.bd:8090/. This is the customized solution. There are three Phases. It is being developed and deployed phase wise. Designing, customization, installation of the Electronic Government Procurement (e-GP) System is the main task. Again testing and providing maintenance support are also key tasks.